Pixar isn’t just a studio name, it’s a promise. Watch a Pixar movie and you know that you will be transported into a fantasy world and leave a trail of happy tears. That’s because what Pixar does best is miraculously capture the childhood experience — whether it’s a deep bond with a toy (Toy Story) or a kindly stranger (Up), the fear of the unknown (Monsters Inc.), finding a home base (Finding Nemo) or the burgeoning emotions within (Inside Out). Its latest entry, Coco, explores the importance of forging an identity outside your own family. A few flaws aside, this is most delightful family film of the season. Well, this and the Killing of a Sacred Deer. Kidding! Young Miguel (12-year-old newcomer Anthony Gonzalez) is not feeling the family vibe this year. A shoe-shiner by trade, he just wants to play the guitar like his hero, 1950s music icon Ernesto de la Cruz (Benjamin Bratt). Alas, his family has strictly forbidden it. Time for Ren McCormack to take this matter up with city council and fight to cut loose and dance!!!!! Oh, that’s not right. Miguel can’t play music because of a family curse. Decades earlier, his musician great-great-grandfather abandoned the family, including his daughter Coco. She’s now addled with dementia. Miguel doesn’t care. He sets out to compete in a local talent show, steals a guitar and, oops, ends up in the Land of the Dead. In most Pixar films, a protagonist is separated from loved ones and traverses through an epic adventure to find the way home. But Miguel is constantly surrounded by family from the get-go. In the Land of the Dead, his long-deceased ancestors (that appear as amusing and not-at-all-scary dressed-up skeletons) muss and fuss over him. They too disapprove his rock star dreams, which is why he sets out for his musician patriarch in hopes that he’ll bless his ambitions and send him back to his living relatives. Miguel’s journey is a visual wonder. In 3D, the orange marigolds that bridge the two worlds pop off the screen. The cityscape is vibrant and bustling. Fantastical neon-gleaming creatures fly through the sky. 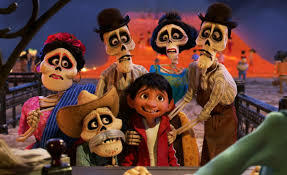 Maybe the images in the land of the dead will distract young moviegoers from the rather-gloomy and stark message — the more you’re remembered post-death, the richer and happier you are. That’s why Cruz is determined to remain an idol even in death. If the living forgets you? Welcome to the other afterlife, where the vibrancy and revelry are absent. This could mean trouble for Miguel’s new friend, a mysterious drifter named Hector (Gael Garcia Bernal). That’s pretty damn bleak. Not Wall-E bleak, but bleak. At least there’s a cute dog. And terrific original tunes such as, ahem, “Remember Me” (by Kristen Anderson-Lopez and Robert Lopez of Frozen fame). The music is woven nicely and effortlessly into the story — i.e., characters don’t just break into song to declare independence. Many of the numbers are sung in Spanish, as it should be. 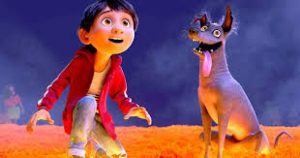 Coco doesn’t look or sound like any other Pixar movie. But it’s still sweet, moving and sentimental. That’s something to celebrate, indeed.